Thank You for Making Al Fresco 2015 A Success! Despite a two year hiatus and a short window to plan the event, Al Fresco 2015 was an extraordinary success in supporting our charity of choice, Edmonton’s Food Bank. Together, our community came together and collected over 900 kilograms of food, a figure which wildly exceeded all expectation. ATB Financial, one of our event sponsors, collected 185kg. Carson Integrated conducted a corporate food drive and collected 120kg. The balance of the food was collected from Shoppers Drug Market City Centre East, the residents living in the condominium buildings that line 104th-St and the businesses and merchants. Well done everybody! Between the online silent auction hosted by deVine Wines and Spirits and various collection points on 104th-St., Al Fresco raised $15,000 for Edmonton’s Food Bank. Doug Hunter, Resource Development & Community Relations for Edmonton’s Food Bank wrote “We are humbled by your generosity. Thank You! Thank You! Thank You!” A cheque presentation ceremony is being planned. We will invite everyone to come down and share this special moment after the final details have been arranged. The online silent auction was an immense success, probably the most successful auction we have had to date. 91 individuals and businesses donated 107 items to the auction valued at $23,350. $19,450 in bids was made, representing an astounding 83% of retail value. Anyone who has ever been involved with organizing a silent auction will instantly recognize the generosity of the bidders who stepped up. Bravo to you all who bid and supported the auction! Very special thanks to all the donors who provided such a vast selection of unique items to the auction. It was wonderful to receive so many items which provided experiences for bidders to enjoy, items such as the Dinosaur Dig, hot air balloon flights, dining experiences and hotel stays. Special thanks to Dirk Chan for administering the online auction, Kandice Little for packaging the items and Chris Arnold for reaching out to our many suppliers for support. Residual auction proceeds of roughly $5,500 were turned over to the 104th-St. Action Committee. The monies will be used to plan future events and fund ongoing community development initiatives. An event like Al Fresco can only take place when a dedicated individuals, groups and business come together to make it happen. We would like to acknowledge the follow champions for making our community drive to help Edmonton’s Food Bank a huge success. Vendors who made financial contributions for hosting the event: Blue Plate Diner, Kelly’s Pub, Tzin Wine & Tapas, Credo Coffee, Cavern, Pampa Brazilian Steak House Food Truck and participating Farmers’ Market members. deVine Wines and Trialto Wine Group are pleased to present a wine tasting and fundraiser in support of community development. 104th-St. and surrounding environs are seeking to become the first Purple Flag accredited area in North America. Please join us for a standup wine tasting on Saturday, September 26, 2015 that will feature seven wines from Vina Montes. Cost is $30 per person. 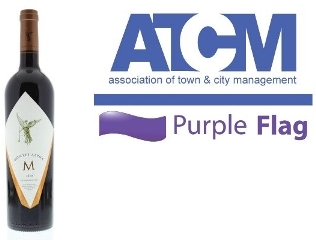 All proceeds will be donated to support 104th-Street’s drive for Purple Flag accreditation. The Purple Flag program aims to foster a safe, vibrant Downtown district for all visitors to enjoy, both at night time and during the day. The tasting will be conducted by special guest Ryan Everitt of Trialto Wine Group. Ryan and Trialto have generously donated all of the wine in support of our community. You will be able to sample the full range of Montes wines at the tasting. Great value, everyday wine like the Montes Sauvignon Blanc and Malbec, as well as their flagship Purple Angel Carmenere, will all be opened for your tasting pleasure. To see the lineup of wines and for registration to this event here.. Please save the date and bring your friends in support of 104th-St drive to become Purple Flag accredited. You and 59 supporters who will help us raise $1,800 for community development!